2017 was another exciting year for Des Moines University (DMU) Continuing Medical Education (CME). Below, you will find a graphic summarizing highlights and accomplishments for the year. DMU provided 399 educational opportunities throughout the United States and Worldwide in 19 countries. 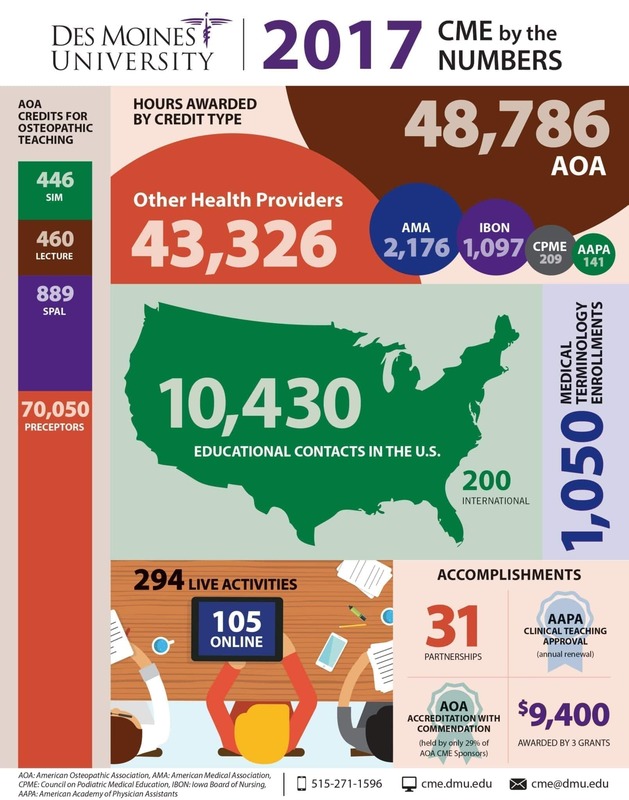 Nearly 10,500 educational contacts were made in the United States, and 200 contacts were made internationally. Learners earned credit through a number of methods, including live, live-online, enduring materials, osteopathic medical teaching, clinical teaching, and more. In 2017, DMU CME was recognized with Accreditation with Commendation from the American Osteopathic Association, an accomplishment held by only 29% of CME sponsors. The department also received almost $10,000 in non-commercial support grant money through The France Foundation, After Cancer: Solutions for Sexual Health, and the Iowa Cancer Consortium. A few of the partnerships with other educational institutions or healthcare entities included: After Cancer, Solutions for Sexual Health, American Cancer Society, Broadlawns Medical Center, Care Initiatives Hospice, Central Iowa ACEs, Central Iowa Functional Medicine, International Spine and Pain Institute, Iowa Arthritis and Osteoporosis Center, Iowa Cancer Consortium, Iowa Department of Public Health, Iowa Health Care Association, Iowa Medical Society, Iowa Podiatric Medical Society, Iowa Psychological Association, Rheumatology Association of Iowa, and St. Jude Hospital in St. Lucia. Thanks to all for supporting the CME program. If you’re interested in learning more about our educational offerings, please visit the calendar or online catalog.